One of my biggest problems with hannah checkers is that they ask you to full in water to the line on the container. Problem is I have seen that up to 13ml of water can go in and still at the line. How can you expected accuracy when water level can vary 30%. Glad they started adding a tool to measure the testing water volume. I didn't listen to the reviews - they're correct. This is WAY too finicky to be a reliable tester. I watched videos on how to do the tests EXACTLY and its only correct 1/3 of the time. When I use I have to double check with a Salifert test so why not just use a Salifert test? I wanted to return but they want return shipping plus 10% restocking fee. Another lesson here is that Amazon has a WAY better return policy! I have followed the instructions to the letter using zero TDS distilled water and consistently get inconsistent results. I have no confidence in this thing. This product has terrible results when using RO/DI water. So now I have to buy a $10 bottle of specialty water and pay $25-30 for new reagents, plus the $50 I dropped on the test that doesn't work? Yea no good. First you have to use distilled water. Then when testing you can get different results. I would test 3-4 times, waist of time and money then I would get 3-4 different results. I just returned the item. I was getting crazy to see how every stony coral continued dying despite obtaining perfect parameters from my Hanna testers (Alkalinity, Phosphate and yes... Calcium). Best practices, investment in additional equipment and supplements, nothing worked. "Your Calcium levels are too low. A lack of calcium can have very bad effects on the aquarium, please act quickly to restore." All this time, my corals have been dying because I trusted in this Hanna tester, I've lost hundreds of dollars because of this piece of crap. If you really want to use this, I strongly advise to have a primary Calcium testers and use this one, just for fun. I find it easier to get a digital readout as opposed to what shade of blue is blue enough. I test and clean with distilled water and I've been spot on when tested against other test kits. You have to follow directions. Reagent, distilled water to the line, zero machine, tank water, powder, shake, test. Keep the tube clear of finger prints. It's that easy. This tester is easy to use and accurate. First thing I did when I received it was to check it against another test kit (Red Sea), the titration results were 400ppm and the Hanna checker showed 396ppm. I would call this accurate. Anyone not getting accurate results is not following instructions correctly. Again this is an excellent piece of equipment and I highly recommend this product. Reefers that are using the Hanna Calcium checkers that are not getting accurate readings, please go view Hanna's YouTube instructional video on how to properly use this checker. I was consistently getting high readings when compared to Salifert and Red Sea tested at the same time. I watched this video a while back and realized what my error was. Since I learned what my mistake was, it is spot on with the other checkers. Don't give up on Hanna just yet! It's a great product when used properly! Please JUST watch the video. Hanna's written instructions do NOT include the needed details to ensure everyone is using it properly! I thought it was clear and I thought it was common sense, too! Hope this helps! Reef on! This is a good tool. I see a lot of negative, mostly on the complicated nature of the test, however, I am used to working with these type of instruments. If you learn to properly clean and wipe the cuvette, Pipette correctly then your test will be spot on. Is this the redesigned version with the new 0.1ml pipette? These are indeed the new test kits with the .1 mL pipette included! We're working on getting an up-to-date photo on the website to reflect this. 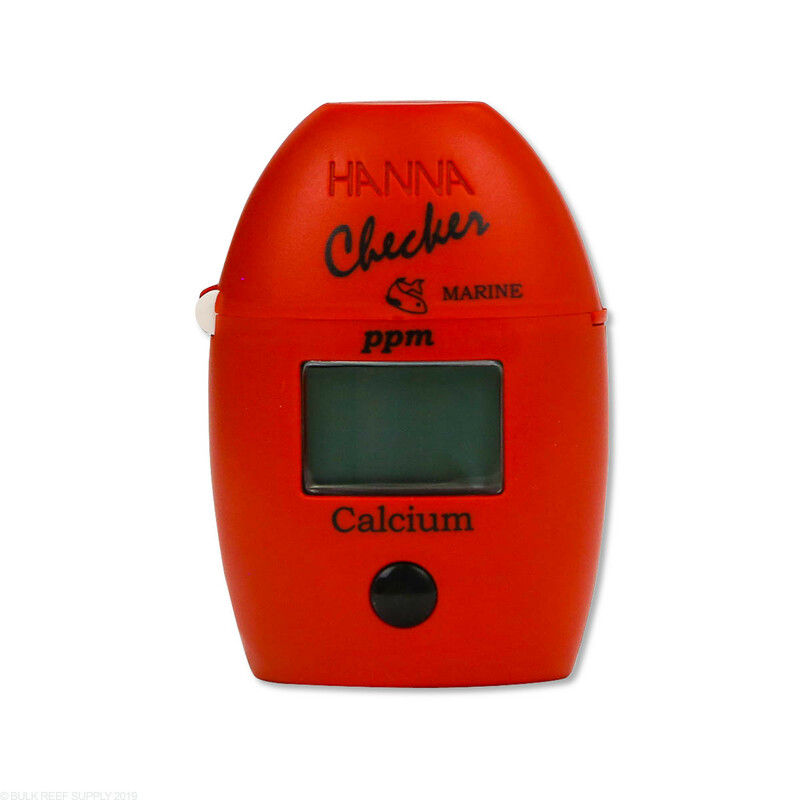 From Hanna's official video (link attached) of this checker in 2016, it comes with a 0.1 ml pipette for adding the sample water. Does the checker sold at BRS comes with the pipette or green syringe? Are the reagent packets really that hard to open and get into the vials? It seems that the biggest/only gripe about this unit in the reviews is that it uses a powder reagent and not a liquid. Is it really that hard to open the packet and get all of the powder in the vial? We do not have issue with the packets, As long as the packet is shaken to the the power into one corner, The flap is then cut and the packet folded to allow the power to fall down the crease in the packet we have not had issues ourselves. Yes, the Hanna Checkers do include a plastic storage case. Does the hanna checker come with the reagents, or do I need to order regents separate? 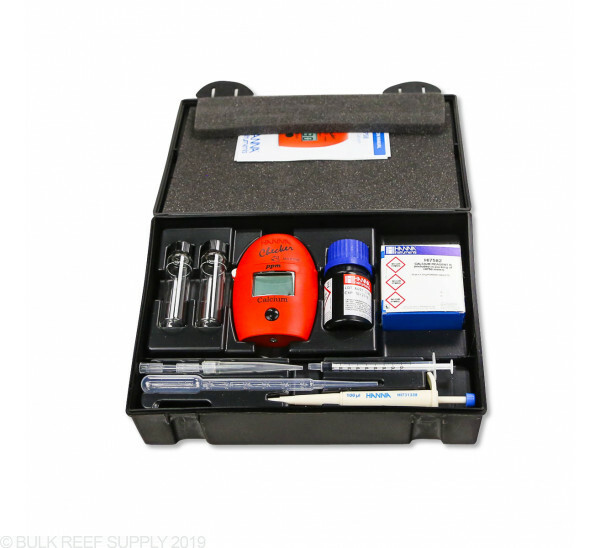 The Hanna Calcium Checker comes with enough reagent to do about 25 tests. They do not make a Nitrate checker. If/when they do though we will bring it in.